For students, there are a lot of interesting apps out there that can help you stay focused in school. We’ve found a bunch of interesting apps that will not only organize your schedule, but apps that can help you budget, track your class notes, and even automatically silence your phone when you are in class. The inClass app allows you to take multimedia notes that you can share by file, through Facebook, or just by printing them right off the app. You can also put together a schedule for all of your classes, tasks for each day and stay up to date by setting alarms for yourself when things are due. iStudies Pro allows you to have a virtual planner for all of your classes. No longer will you have to track everything in a paper planner. iStudiez will give you a way to put together a calendar of your classes and assignments, as well as a way for you to track your semester progress, including your GPA! Mint offers a pretty cool app that will help you stay on track with your budgets. Mint allows you to see all of your accounts in one place so you never lose track. It will also keep a log of bills you’ve paid and upcoming bills that you’ll have to pay, as well as suggestions on how you might save money. Don’t let the name fool you: This app is all business. NoteBook allows you to keep your documents all in one place, and the cool thing about it is that it looks like a paper notebook. You cannot only outline through this app, but you can add action items to the notes you take, assign due dates to things, and send important dates to your calendar and your phone. Dropbox is a great way to save your files in one place that you can access from anywhere. Dropbox will be a lifesaver when your printer runs out of ink or when your computer crashes the night before your 15-page paper is due. Studious is a great way to keep track of your assignments so you never lose track of when things are happening or when assignments are due. This app also gives you a way to save a copy of your notes either in text or in a photo. However, probably the coolest thing about this app is that you can set it up so that your phone will silence itself while you’re in class. This app is pretty cool because it allows you to scan documents right from your phone or tablet. This makes it easy so that you can automatically save an electronic copy of important documents, notes or an assignment that you can then share. This app is great for those people who have trouble waking up in the morning. Alarm Clock Xtreme allows you to set many different types of alarms, including a music alarm, a rising volume alarm, and even an alarm that requires you to do a math problem in order to snooze or dismiss the buzzer. These are just a few suggestions. For more awesome apps, be sure to check us out on Pintrest! Well, you will survive that day, and you can survive the rest of the semester. It’s not all that bad. Sure, the first day is a little scary, especially when you get a look at all the work you’ll have to do and all the policies you’ll have to follow. However, it can be simple, and this is why we’ve put together some tips to help you to get through the scariest part of the semester so you can make it to the easiest: The minute you pass in your final exam. Take a walk around campus to find your classes the day before. Although you may feel a little dorky, but it really helps; a lot of students on their first day get lost and end up getting to their classes late. In an article at Surviving College Life, they explain that it’s a good idea to walk around campus the day before your classes start. You can even bring a couple of friends or your roommate along with you. It’s easier to find the buildings when you’re not pressed for time and stressed out. Don’t be afraid to ask questions. Whether it’s asking someone in your class if you’re in the right class, asking for directions to a building, or asking your professor for clarification, it’s important to ask questions. Even if you feel weird about asking questions, you shouldn’t; all the other freshmen are in the same boat and so you’re not alone. Be sure to get the facts so that you’re not wandering aimlessly around campus and miss your class, or that you end up in an art class when you were supposed to be in a business class. Take a minute to meet the person next to you in all your classes. This will not only give a buddy in all of your classes who can work with you on projects, but it will also give you someone to commiserate with when you think the test was too hard or you just can’t seem to get through that paper. This will also give you someone to contact when you miss class or misunderstand something the professor said. Don’t be intimidated. The most important thing to remember about the first day, like we said, is that you’re not alone; there are plenty of other freshmen who are in the same boat as you. It’s important to just avoid getting bogged down with trying to memorize all the policies, remembering when all of your assignments are due, or overwhelming yourself with the thought “How will I ever get through this?” Make sure to have fun in your classes and to try to get something out of them. College should be a great experience, and you shouldn’t let yourself get totally intimidated by all the work you have to do. Just remember to keep your chin up, because you can get through all your work and have fun at the same time. For many incoming freshmen, college can seem very scary. You are suddenly given greater independence, but with that comes a lot of new experiences and responsibilities you’ve never had to experience before. Before you head to school in the September, you may be wondering how you’ll ever adjust to all of this. You’re certainly not alone; at JumpOffCampus, we certainly remember that feeling. This is why we’ve put together some tips to help make your transition to college a little bit easier. 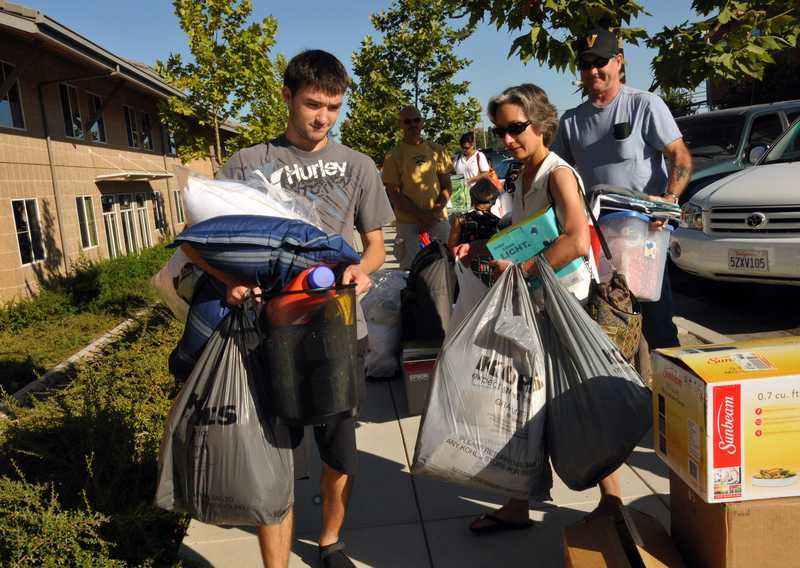 Don’t expect all the comforts of home when you move into your dorm. In an article we read by Cristiana Quinn at GoLocalProv, she explains that while living in the dorm is a great experience, you can’t expect all the comforts that you might get at home. For starters, you most likely won’t have your own room. This means that you’ll be sharing a room with at least one other person. As we’ve mentioned in some of our previous posts, you have to make sure that you are conscious of that and you’re considerate of your roommate(s). You also can’t expect to spend all your getting ready in the bathroom in the morning. If you have a shared bathroom with 3 or 4 other people, you need to be considerate of their schedules as well. This means not taking long showers in the morning or hogging the bathroom. Be aware that maybe others have a similar schedule as you and will have to be getting ready at the same time. The best thing to do is to find out everyone’s schedules and schedule shower times. Stay on campus. In an article we read at University-College.net, they explain that one of the biggest issues freshmen have is staying on campus (especially on the weekends). As we mentioned before, your dorm room is not going to have all the comforts of home that you may be used to. However, it’s important to stay on campus to stay connected to campus activities and events. This also gives you more time to make connections with new friends and foster new friendships. Keep looking on the bright side. According to the article at University-College.net, it’s important to keep a positive attitude when you’re adjusting to life in college. While it seems like your entire life has been completely turned upside down, the important thing is to not get bogged down by a fear of this change. You need to stay positive and embrace this change, because if you do, college really can be one of the greatest times in your life. Make new friends. For many freshmen, there can be a great temptation to stay connected to only those friends who you knew from high school. While those relationships should still be important to you, it can really hurt you should you choose to avoid meeting new people. This is because you’re other high school friends will continue to go on to meet new people, but you won’t. You start feeling left out if they are always hanging out with their new friends and you’re left alone. The best thing is to meet people in your class, join a student group or organization and get more involved on campus. Even the shyest of people can meet others this way. Stay focused. It’s important to stay focused, despite having all this newfound freedom. It can be tempting to go to every party or hang out with your friends every weeknight. However, you have to make sure that you balance your social life and your academic one. Remember that you’re at college to learn, which means that you have to stay up on your homework, assignments, and reading to stay in college. While going away to college can be intimidating, we hope that by following these tips it will make your transition just a little bit easier. Just remember to that this is your experience and that no one else can determine what your college experience will be; you’ll have to do that on your own. In this way college can really be a great experience that you’ll take with you for the rest of your life. For college students, eating healthy is often far from their minds. I mean, let’s be honest here: The fact that you’re in class all day and have to study all night means that you’re not always going to make it to the dining hall to eat. And who can resist that pizza at 3 am from the pizza place at the top of campus? However, you have to remember that pizza won’t keep you looking trim. This is why we’ve put together some suggestions to help you avoid the freshman fifteen. Avoid late-night snacking. A recent study at Northwestern University has actually proven that those who eat late at night gain about 28% more weight than those who eat during regular hours. If you’re trying to avoid the freshman fifteen, it’s probably not the best idea to eat that pizza at 3 am. Eat balanced meals. You should be splitting up your meals based on a balance of proteins, vitamins, minerals, carbohydrates and fats. It’s significantly healthier for you to be eating a variety of foods, rather than just carbohydrates, even if you are eating fewer calories. Keep a stock of healthy snacks in your room. This will keep you from ordering out for pizza or heading down to the vending machine when you’re a little hungry. Limit the fast food. Even though it can be significantly more convenient when you’re on the run, it can be one of the leading causes of the freshman fifteen. While it’s not friendly for your body, it’s also as equally unfriendly for your wallet. In Debby Mayne’s article “Healthy Eating Habits for College Students,” she explains that if you do eat out, you should avoid French fries and other fried foods, and order a salad or sandwich that doesn’t contain on that fried and greasy meet. She also suggests that if you’re ordering pizza, you stay away from pepperoni and add toppings like olives, mushrooms, green peppers and even Canadian bacon (it’s lower in fat than pepperoni). Drink water. According to an article by Yonika Willis at Livestrong.com, drinking more water can actually help you lose weight because it makes you feel fuller and helps you to avoid overeating. Willis explains that by drinking eight 8-oz. glasses of water daily, you can burn off almost 35,000 calories a year, or about 10 pounds. It also doesn’t hurt to drink water throughout the day so you don’t become dehydrated. Limit sugar. Even though that Red Bull or that candy bar can get you through long nights of studying, it’s not the best idea if you’re trying to avoid the freshman fifteen. Limit the foods and drinks that are full of sugar, and reduce the amount you put in your coffee and tea. Avoid taking your coffee with cream. Coffee is the lifeblood of the college student, but what many students may not know is that taking their coffee with cream could be added a significant number of calories and fat to their diet that they don’t factor in. According to another article by Kristen McCarty at Livestrong.com, a typical medium coffee from a coffee shop is about 16 oz, and while the calories in black coffee is minimal, you add about 50 calories for every teaspoon of cream you put in. Cream can also be anywhere 18 to 30 percent fat. That’s why it’s better to start taking your coffee with skim milk (adds only about 10 calories per 2 tablespoons) or black, as it will add fewer calories. While it’s important to be sure that you have a balanced diet, it’s also important to have fun. Having pizza every now and then is certainly not a problem, but just keep in mind that everything should be in moderation. It’s the all-the-time and the excess that will have you seeing the freshmen fifteen.